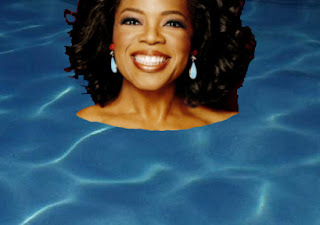 The Rabbi with a Blog (Rabbi Jason Miller): Did Oprah Go to the Mikveh for Her New Show? Did Oprah Go to the Mikveh for Her New Show? What has Oprah Winfrey been doing since ending her long-running afternoon talk show last May? If your only news source was JTA.org (the Jewish world's version of the AP), you might think that she has embraced Judaism on the level of Madonna or Demi Moore. A misleading title grabbed many people's attention this week when the JTA published a news brief with the bold header stating "Oprah visits mikvah for new show." My colleague in Israel, Rabbi Andy Sacks, re-posted the news brief on Facebook and wondered allowed: "Now I have heard of going to Mikveh for Taharaat Mishpacha (family purity), before Haggim or Shabbat, for dishes, conversion, etc. But this is a new one on me." Well, apparently Oprah did not embrace the Jewish ritual of immersion in a mikveh before launching her new show (that would have made more headlines I'm sure), but she did visit with two Chasidic Jewish families for an upcoming episode and toured a mikveh. The new series called "Oprah's Next Chapter" will premiere in January on her OWN network. Writing on the Forward's Shmooze blog, Renee Ghert-Zand explained that Oprah stopped by Congregation B'nai Avraham's new state-of-the art ritual bath while scouting locations to film segments for her new show. "The Shmooze is guessing that the visit to the synagogue’s new, has something to do with Winfrey’s plans to touch upon the halachic concept of 'family purity' and the related spiritual nature of immersion in 'living waters.' While a crowd of neighborhood people gathered around to get a glimpse of the highly influential mega-celebrity, mikveh lady Bronya Shaffer admitted to knowing virtually nothing about her or her work." If the mikveh ends up being showcased on Oprah's new television show, the Jewish ritual of becoming purified after mikveh immersion at the end of a woman's menstrual cycle could take off on a large scale. Just look at what effect Oprah had on book clubs! With respect, in regard to your public statements on the visit of Oprah Winfrey to a ritual bath, you and the rest of the Jewish community need to get over the paleolithic and extremely offensive idea that women require purification because of biology. I am always amazed at the vitriol so many people have for the Islamic view of women, while giving the similarly vile Jewish view of women a pass. You're both sexist and centuries out of date. The glee with which you viewed the possibility that Oprah might make the ritual bath popular was sickening--although in the extremely reactionary culture that exists in the United States these days, also a possibility. More's the pity. I linked to your blog mentioned by Rabbi Sacks in his JPost column regarding Oprah and her recent visit to a mikveh etc. As someone whose 30 years of mikveh days are now behind her, permit me the hindsight to say this: it would be a shame if Oprah swallowed the candy that sugar coats mikveh and the so-called 'honeymoon every month' martketing used to sell it. I wrote a column about this at The Forward a couple of months ago; while discussing my frustration with the childish, fairytale myths surrounding mikveh and its hallowed place within marriage, I muzzled my feelings of dismay and deep resentment. It is not just the way mikveh and taharas hamishpacha are sold but that its educators willfully ignore its drawbacks and difficulties. And adding insult to this is the fact that women have no say in how mikvehs are operated, particularly whether they meet municipal health and safety regulations. I have no doubt Oprah will indeed drink the mikveh Kool-Aid.